“All great art is narrative in some way. Not that a piece of art needs to tell a story in order to be great, but what truly distinguishes something is its place in a larger context. While good art of any sort can be defined by the immediacy of its aesthetic, great art exists in narrative crosshairs that make it representative of something bigger than itself. It’s why classic paintings can capture a period of history as much as any account of facts or why our favorite songs tend to be the ones that bring us back to specific moments from our lives; they’re intertwined with the things going on around them in a fundamental, inseparable way. 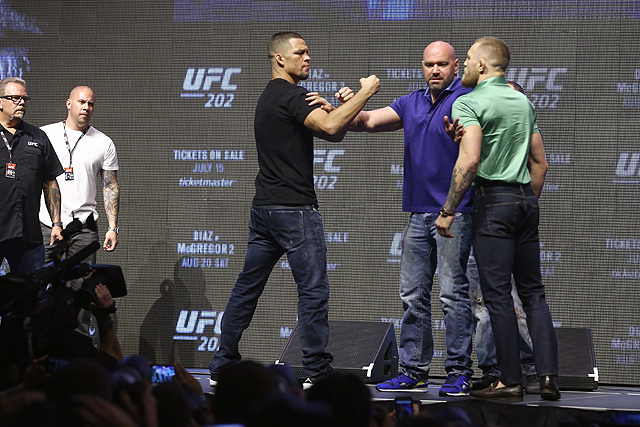 “The Ultimate Fighting Championship’s most marketable rivalry will finally get its second breath. 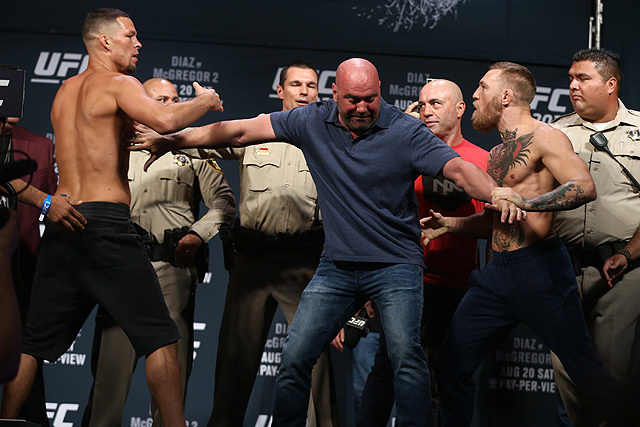 After a superlative 2015 campaign, the outspoken Conor McGregor entered his March showdown with Nate Diaz with an aura of destiny. At that point, McGregor was undefeated in the UFC and had not tasted defeat since an early career submission loss in 2010. After the Irishman tapped to a rear-naked choke from Diaz, the rematch was booked for UFC 200, but a maelstrom of drama surrounding press obligations and faux-retirement unfolded, pushing it back until now. This will be McGregor’s second fight above 145 pounds and his second fight of 2016. 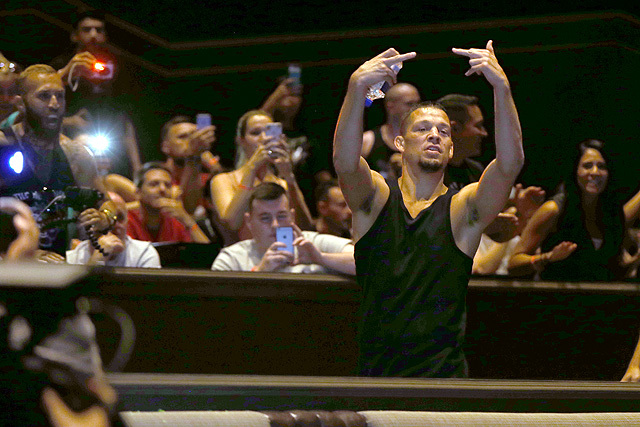 On the other side of cage at UFC 202 on Saturday in Las Vegas will be longtime MMA antihero and cult favorite Diaz, who notched the most important win of his career when he throttled McGregor at UFC 196. Since then, he has become a bona fide star in the sport. The winner of “The Ultimate Fighter” Season 5 has nearly a decade of UFC fights under his belt, as well as stints in World Extreme Cagefighting and a one-off Strikeforce bout, making him a true veteran of the sport. 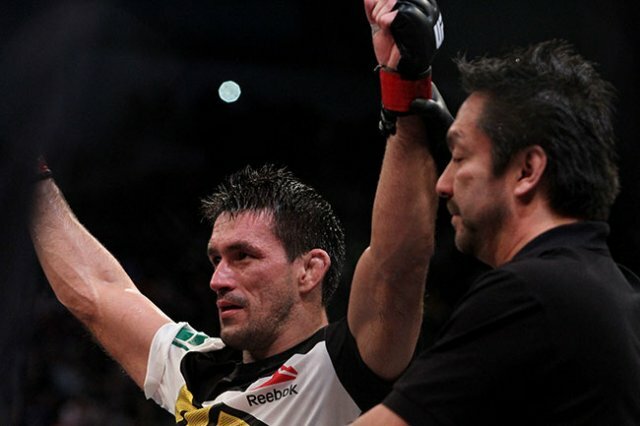 Diaz is 3-3 in the UFC fighting above lightweight, and this will be his second fight of the year. “In part two of this special feature, we bring you the five remaining Ultimate Fighting Championship titleholders, from lightweight to heavyweight. This, of course, excludes Jon Jones. 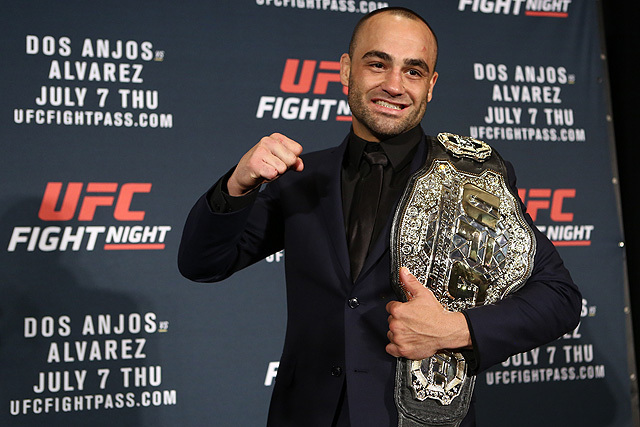 He was the interim light heavyweight champ but has quietly been taken out of the official UFC rankings. For those curious souls, his album analogue was 2-Pac’s “All Eyez on Me.” I’ll let you use your imagination as to why. “If MMA was music, it would have to be rap. Not only is individualism at the forefront of the sport and the genre, but both encompass a unique aesthetic that blends gritty toughness with technical artistry; the word “art” is one-third of MMA, and if we are being honest, rap at its best is everything poetry wishes to be. It is only right then to anoint the greatest MMA fighters in each division by comparing them to the rap albums that best encapsulate their fighting styles, personalities and careers.